Two days ago, Angie and Maria observed a curly eating the flower of a species of orchid native to the Bahamas (see picture of flower below). They were both very excited to share their observation, particularly because the curly repeatedly reached for the flower petals from a different perch than the one that the orchid was attached to. Here is how Angie described her observation to me: "While searching for anoles I witnessed something unexpected. Maria had found her first anole accidentally when she was observing an orchid. I found a different orchid and thought that I might get lucky and find an anole nearby, but instead I noticed a curly-tail lizard perched next to it. I started to record the lizard’s information and when I looked up again it was chewing on the orchid. “Hey Maria… the curly tail’s eating an orchid- do they do that? !” I thought that it might have been a mistake but a few moments later the curly-tail leaned over from its perch and started chewing on the flower again. By the time it was done, the majority of the flower was gone. A little while later, Maria witnessed the same lizard biting the flower again. There aren’t very many anoles on cay Y5 and they usually perch very high; maybe they curly-tails have as much trouble finding them as I do." When I heard this, I told them that it was "pretty cool" which it is. But in the back of my head, I was thinking that such an event must be very rare or that maybe the curly was simply trying to catch an insect and in the process also consumed part of the flower --although it does look like the curly at least reached for the flower twice. However, on the following day, I observed the identical behavior: a curly climbing up a perch, plucking the flower off an orchid. On this occasion the lizard grabbed the whole flower, tearing it off from the stem. Seeing the same behavior on two different days and in different areas of the cay came as a big surprise. The likelihood of observing a rare event two days in a row, by definition, is extremely low and therefore pokes holes in my original idea of a rare event. 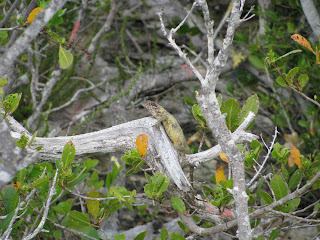 A couple of recent reviews have addressed the possibility that lizards might serve as pollinators and seed dispersers. Data supporting these ideas comes from observations documenting that a number of lizard species include fruit and nectar in their diets. Interestingly, this phenomenon might be more common in islands. However, in our case instead of acting as pollinators, the lizards might be having a negative effect on the fitness of the orchids. Based on my observations, this species of orchids produces a relative small numbers of flowers during a narrow period of time --late spring early summer. Therefore, loosing their flowers to predation might be costly, in terms of reproductive success. Thus to determine how common this orchid-eating behavior might truly be, we began a pilot project today, which is being spearheaded by Maria and Angie. We will give an update of our success (or lack thereof) in a fortnight.